Part of the Cohutta Mountains, a small mountain range at the southern end of the Appalachian Mountains, Fort Mountain takes its name from the remnants of a stone formation located on the peak. This ancient 885 feet-long zigzagging rock wall was built from stones that are from the local area around the summit. It is up to 12 feet thick and up to seven feet high, but generally rises to a height of two or three feet. 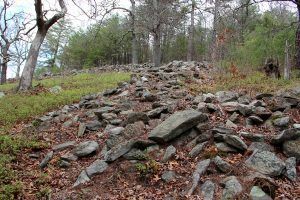 The wall, which is scattered with 29 pits, cairns, small cylinders, stone rings, and ruins of a gateway, is said by some sources to have been built around 400-500 AD, while other sources say that the date has not been determined. There are several theories as to who might have built this wall. Early visitors referred to the formation as a fort, speculating that it was built by Hernando de Soto to defend against the Creek Indians around 1540. However, this theory was contradicted as early as 1917, when a historian pointed out that de Soto was in the area for less than two weeks. Two other legends say that the wall was built either by the Moon-eyed people according to Cherokee lore or is contributed to a Welsh prince who was said to have made his way to America in 1170. According to Cherokee tradition, the moon-eyed people lived in the lower Appalachia region before the Cherokee came to the area during the late 1700s. The people were said to be called “moon-eyed” because they saw poorly during the day and could see very well at night. They were also described as being small in stature, the men bearded, light-eyed, and having pale white skin. One early historian described them as albinos who were possibly the ancestors of the Kuna people of Panama, who have a high incidence of albinism. The Cherokee, who drove them out of the region, say that these people built the ancient structures in the area. Supposedly, a temple had once stood inside the fortification which contained a giant stone snake with ruby eyes. The moon-eyed people were first mentioned in a 1797 book by Benjamin Smith Barton. Later documentation tells of similar accounts, such as an 1823 book, The Natural and Aboriginal History of Tennessee, which tells of of a band of white people who were killed or driven out of Kentucky and West Tennessee. Who were these moon-eyed people? Some say they might be of Welsh descent. This story tells of a prince named Madoc (or Madog) ab Owain Gwynedd, who fled his homeland after the death of his father, which had created a Civil War among his seven sons. The sons were to fight to determine who would rule their father’s lands. To avoid the bloodshed, Madoc set sail with his brother Rhirid and a few followers in 1170 and was said to have landed somewhere around Mobile Bay, Alabama. Some time later, Madoc returned to his native country and recruited more followers who returned on ten ships to settle in America. After setting sail, they were never heard from in Wales again. Some speculate it was these colonists that built the fortress wall. Allegedly, the Fort Mountain stone work wasn’t the only one they built. Legend also attributes one near DeSoto Falls, Alabama, which is said to be nearly identical to the setting, layout, and method of construction of Dolwyddelan Castle in Wales, the birthplace of Madoc. Minor fortifications in the Chattanooga, Tennessee area are also attributed to these Welsh people. In an 1810 letter, former Tennessee governor John Sevier wrote that the Cherokee leader Oconostota told him in 1783 that local mounds had been built by white people who were pushed from the area by the Cherokee. According to Sevier, Oconostota confirmed that these were Welsh from across the ocean. Madoc’s travels, first told in print about 1584, had also been told in Welsh songs and stories since the twelfth century. Were these descendants of Madoc’s colonists the Moon-eyed people? Many generations of explorers, archaeologists, geologists, and historians have wondered about the identity of the unknown builders and the purpose of their handiwork. Some believe that the wall had a a ceremonial function since it lacks certain characteristics necessary for defensive purposes, such as its relatively low height and the lack of water within the wall. Current legends tell that the sounds of distant drums, flickering lights, and the images of men wearing bearskins have been encountered along the collapsed wall. 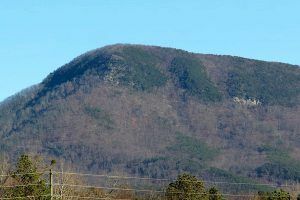 Today, the mysterious peak is part of the Fort Mountain State Park, which is also known for its unique scenery, a mixture of both hardwood and pine forests and several blueberry thickets. In addition, the park contains a 17-acre mountain lake. It is located which is seven miles east of Chatsworth, Georgia off GA 52.